Now then, I've talked about books banned in Malaysia in past posts. Some book bannings have been publicly proclaimed, though never debated. Other books you don't know are banned until you try to get hold of copies of them and the suppliers tell the bookshop that they aren't allowed to bring in copies. The word used of such books is "restricted". But it amounts to the same thing: you can't get a copy unless you sneak it in to the country. But right now I'm utterly, totally, absolutely gobsmacked. 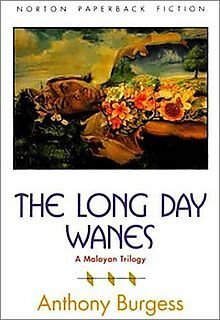 Anthony Burgess' The Long Day Wanes (A Malayan Trilogy) is apparently on the restricted list too. I have read it. I read it when I first came to Malaysia in 1984, loved it, based my decision to move to Kuala Kangsar ("Kuala Hantu" in the book) on it. Then my reading group chose it as one of the books of the month, a year or two back. They all enjoyed it too. There was no problem in getting copies - they were piled high in all the bookshops. But a week or two ago, a friend tried Kinokuniya for a copy and was told, sorry the book wasn't available. I heard the same story yesterday evening from Phek Chin at Silverfish after she'd tried to order a copy for a customer. I'm just waiting to hear from Renee at MPH, but think I know the answer already. Burgess isn't complimentary about the Malays, it's true. Or the Chinese. Or the Indians. Or the Orang Asli. Or even, come to think of it, the beer-swigging, incompetent British. But there's more than a grain of truth packed into this colourful piece of satire, and surely this is one of the most important novels written about this country. Are we honestly not allowed to read it? And by extension ... are Malaysia's own novelists (present and future) also condemned to writing platitudinous prose that does not step on anyone's toes? It's fifty years since the first part of the trilogy, Time for a Tiger appeared, just on the cusp of Independence, and there are plans afoot (about which I can say nothing as yet) to honour Burgess as both writer and teacher in the coming months. We'd like The Malayan Trilogy unrestricted as soon as possible, please. Another nail in the coffin for a forward-thinking and tolerant Malaysia. That's what we'll all mourn on Merdeka Day. So ironic - on Independence Day we'll celebrate the loss of freedom. That's shocking and disturbing and infuriating news. Burgess managed to capture the spirit of Malaya and its peoples (and the Brits) well, I thought. So what if all the races didn't come out well under his pen? I'm sure many of us had wry but good-natured smiles while reading the book. By the way, there's a good program on TV3 (never ever thought I'd use "good program" and "TV3" together in a sentence!) on Mondays 7 p.m. - a doucmentary series on the Emergency, "Jungle Green, Khaki Brown". The spin-off book is that massive hardcover book recently seen on the shelves. Sympozium, not sure where you've been - celebrating the loss of freedom on Independence Day? We lost it a long time ago. Also rather perplexed by your reference to Singapore as a tolerant country. I don't think Malaysian writers should self censor. We need to keep hacking and hacking away at this restriction. If enough writers are bold to say what everyone is thinking anyway, then we're making progress. Who restricts these books anyway? I need names to mock! Should we start with Rais Yatim? Unrelated again, I know, but... Oh my, Sharon, check out these library photos! So... so... beautiful. Banned books are gazetted under the Publication & Printing Presses Act. I once sent Sharon a long list of them. The Minister in charge is Minister of Home Affairs. Not sure if its Badawi or Khalid whatsit (husband of Wanita Melayu Tercantik). Rais has very few laws under him, the new Heritage Act is one of them. I'm not sure who recommends that books be banned and whether it goes through some committee. I'm curious though and will find out. Ministers of course rarely make decisions, they are advised by their ministry officials. Anyway Sharon, this is something PEN will have to understand inside out. If you look at Lee Kuan Yew's latest statement about turning Singapore into the "Paris of the East"...and I've always been able to obtain titles in Singapore AND Bangkok even though Malaysia has banned or restricted them. I'd haveto say the arts scene in Singapore is much more tolerant. Thanks animah. I had a feeling this was going to be complicated... but at least now I know who to zone in on. Do tell us if you find out who has the power to ban books. Wonder if it's the same committee that bans films? A bunch of old datuks deciding what's good for the people. I second the motion to unrestrict The Malayan Trilogy as soon as possible. (want to read it) Plus all the other books. This burying of heads in the sands cannot continue. It appears from sympozium and animah's comments that I was contemplating Merdeka Day in the same light. But of course... so are so many others. But then, I've been reading some juicy titles about the events of the English revolution these past weeks, Cromwell etc. -- so I'm already in a bloody frame of mind. there's another one there left, so hurry! machinist - in a bloody frmae of mind? oh goodness, whoever has the temerity to ban books should be very afraid of you! Just found out, this book has disappered from my college's library catalogue. Used to be there, I know because I looked. It's something you'll probably identify with, Sharon. And the great thing is ... I have a 5x7 notecard of the picture that I bought for you. I've got it, and all you have to do is let me know when I can come over with it. erm, why u wana investigate when u can order online? OK wat. erm, i really donch understand! Maybe because she wants to feel the book and make sure it's the right one she's buying? With online, sometimes you never know. It arrives, you open the package, and it's not what you ordered - how? visitor - because 1) it's a matter of principle - how dare anyone dictate what we can and cannot read. 2) because i like a scrap when i feel i have the moral upperhand 3)because we will be doing readings and organising activities around the book and we will need multiple copies of it! chet very many thanks - i love the picture! I bought a copy from MPH a couple months ago. I think Malaysia bans anything half-heartedly though. You can get a lot of books that are supposedly banned at Kino. was thinking - maybe the copy that kino does have came in from the US via a different distributor? My visits to Kino (and I'm there almost every day) make me think that the edition Kino brings in is the UK Vintage edition, the one with the green cover of the Malayan jungle. Kino had "The Long Day Wanes" once, many months ago, but since then before the ban, the Vintage edition is the only one I've seen on its shelves. Karen Armstrong's Battle For God is still there though. "I'm a terror when I get angry about something..."
Y'know.. sometimes I think books are banned because people don't want to read it, they're in denial and can't handle the unpleasant truths. I've lost count of the number of people who want to censor (and censure) me because I tell the truth, however unpleasant it may be. And you know what, it's the PEOPLE that want to do that to me, not the government. We're all condemned to writing platitudinous prose because people have sacred cows that should not be slaughtered. It's just that the sacred cows are different for everyone. I mean, first you say we have to respect other people's feelings, then you say we should write the truth, however many toes we step on. I don't think you can have it both ways. Sometimes the truth is unpleasant, and people have a strange tendency to be hurt by unpleasant truths. Actually, _I_ feel bad writing this, so I just hurt my own feelings writing it :) But the truth is the truth, and like you said, we have to say it, if we smile and pretend it doesn't exist it doesn't go away. If you pretend it doesn't exist it doesn't go away. So let me know what your stand is on blog posts. If you feel that no toes should be stepped on, then perhaps you shouldn't be stepping on any, and I will do likewise. I will be hurt (and no doubt you as well) but it's your blog, so it's up to you. But for the sake of freedom on the Internet (and to support the only country that's ever put that freedom in writing) I'd like to be allowed to speak the truth, no matter how unpleasant it is and how many squashed toes that might result in, and would very much like the same for you, and every other writer on the planet. My one and only standard is this : that it is true. However unpleasant a truth may be, it is still a truth, and as such deserves to be said. There should be no "sacred cows". Having said that, sometimes I do say things that are wrong (like that "like everyone else" post) for which I humbly apologize and promise that it will not recur. Once again, I'm sorry about how all this sounds. I know feelings are going to be hurt. But you have to understand, it's either that or platitudinous prose. I thought long and hard about it, and almost didn't write it. I have to force myself to post this now, so I will. I bought the Malayan Trilogy in KL the other day. They also had a copy under the original title of The Long Day Wanes - bot in Kinokuniya, or whatever its called. You can buy them both in Singapore too. I bought it recently too, from Times Bookstore. Maybe the ban was lifted? The book was never officially banned which makes it confusing, but it was confiscated/restricted. (and then only under the british title). then quite silently the book was back in the bookshop after we kicked up noise.